My husband will tell you that our lives more or less revolve around where I've discovered on Instagram. I'll announce I want to go somewhere and within seconds he's guessed that it's somewhere that I've found whilst scrolling through my phone. If there's one thing that pops up on my Instagram more than anything else it's the delicious breakfast dishes at Kiln in Ouseburn. My obsession with Kiln started from the moment people started posting the most amazing shots of themselves stepping into the spotlights painted on the outside of their building, and as soon as I realised that the interior of the building was just as beautiful and that the food was getting great reviews I had to make a plan! Unfortunately, it's taken me months and months to finally try the breakfast at Kiln, but wow was it worth the wait! If you don't already know about Kiln (maybe you're not as obsessed with Instagram as I am!) then you may not have stumbled across this little gem yet. 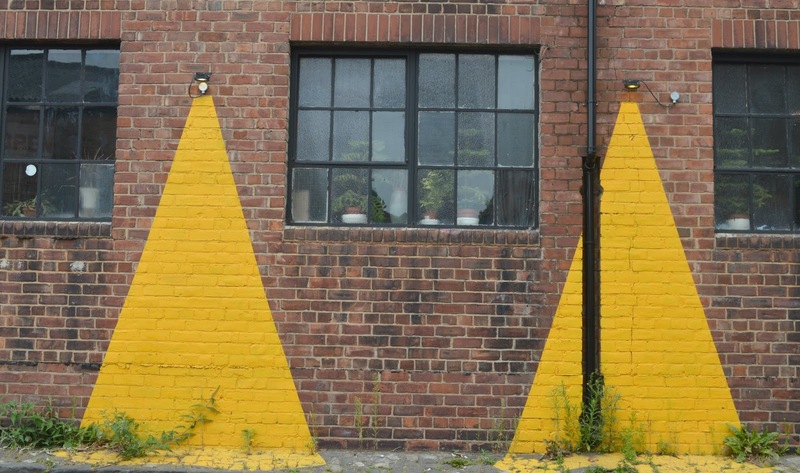 Hidden away in the depths of Ouseburn, Kiln's home is in a beautiful old industrial unit. Urban vibes, effortlessly cool and the kind of place where everyone is welcome. 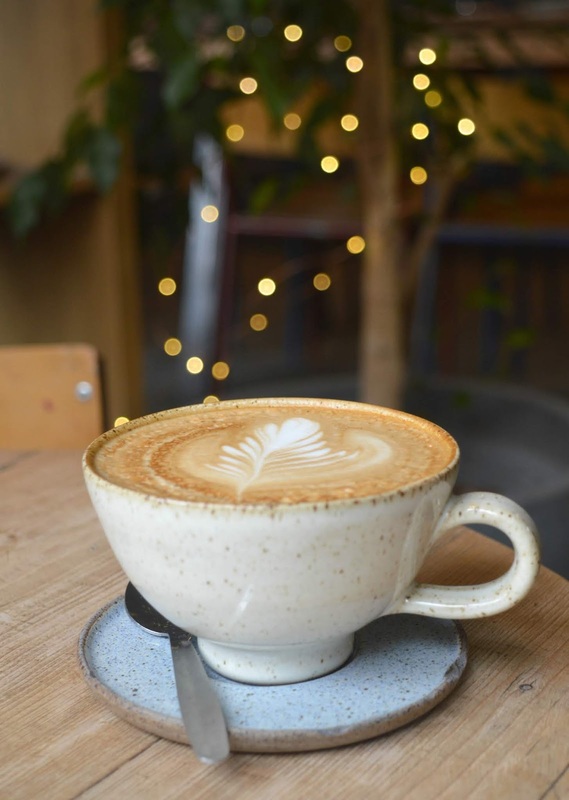 Part bar, part cafe, part ceramics shop and part pottery workshop it's one of a kind and you'll struggle to find anywhere in Newcastle for breakfast with as much character as Kiln. 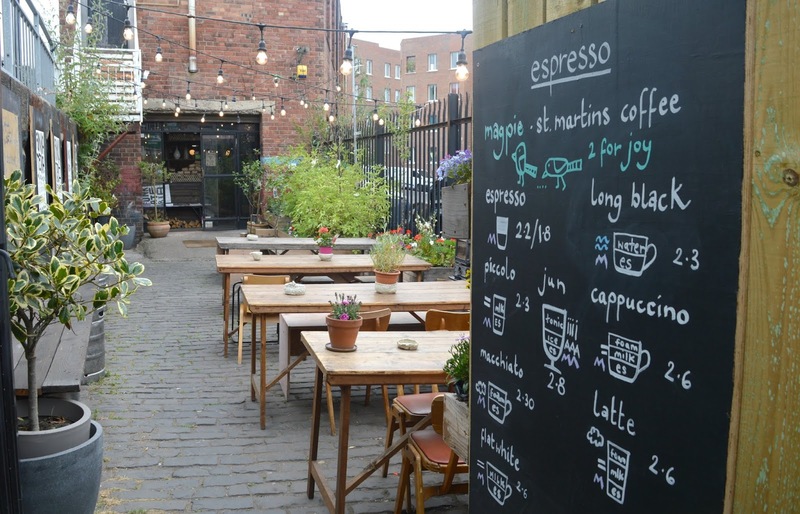 The perfect spot in the Summer, Kiln has the loveliest terrace sitting underneath strings of lights and bursting with colourful flowers it is, perhaps, Newcastle's greatest place to hang out with friends in the sunshine. If you prefer to snuggle away indoors then the inside of Kiln is just as beautiful as the outside - stone floors, wooden tables, shelves covered in homemade ceramics, cosy corners and a cake counter to write home about. I turned up solo, taking advantage of having a day to myself to indulge in a leisurely breakfast in my favourite part of Newcastle. 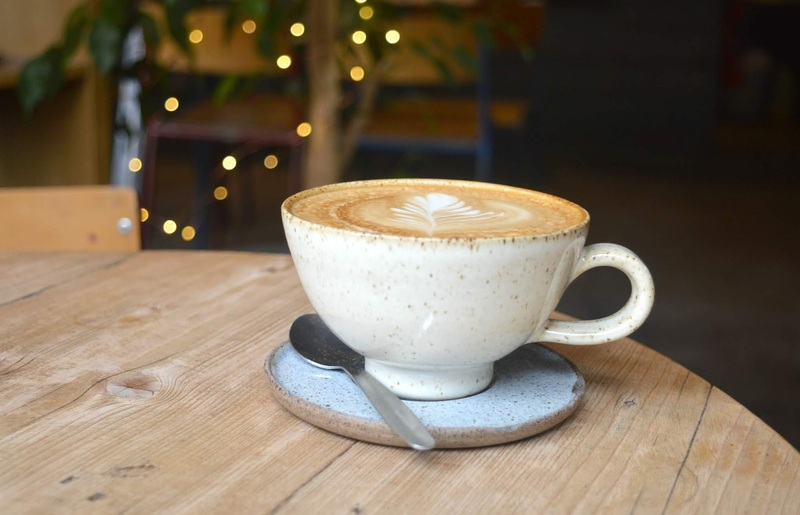 Kiln is definitely the kind of place where it doesn't matter if you want to dine alone, approaching the counter to ask for the menu I was greeted by the friendliest smiles - the staff at Kiln are absolutely lovely to chat to! I settled myself down in a corner with a cup of coffee served in one of Kiln's beautiful mugs. Made in their own pottery, the cups and plates they use are available to buy and are absolutely stunning. I'd love to completely fill my kitchen cupboards with their lovely things. Although there isn't a specific breakfast menu at Kiln they serve food from 10:00 am and many of their dishes are suitable for brunch. When I said I was there for breakfast they even offered to go off menu and make me up some granola. 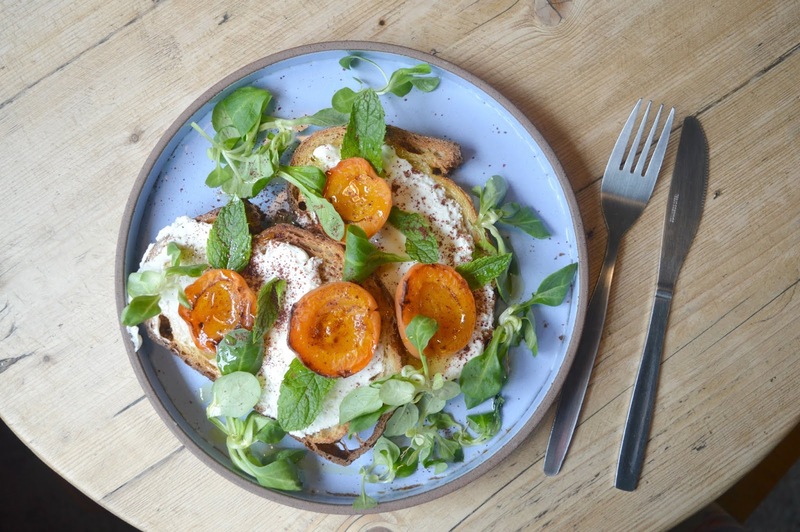 There were plenty of tempting dishes to choose between including Turkish Baked Eggs and Crushed Broad Bean with Poached Egg but one dish in particular really caught my eye - Baked Apricot on Sourdough Toast served with Northumbrian Goats Cheese and topped with Mint Leaves. When my plate appeared in front of me I couldn't believe how colourful it was. The most beautiful breakfast I have ever seen, I must have spent a good 5 minutes just admiring it before finally picking up my knife and fork to dive in. It was heavenly! The flavours were spot on, the cheese was so creamy and the apricot added that perfect amount of sweetness. 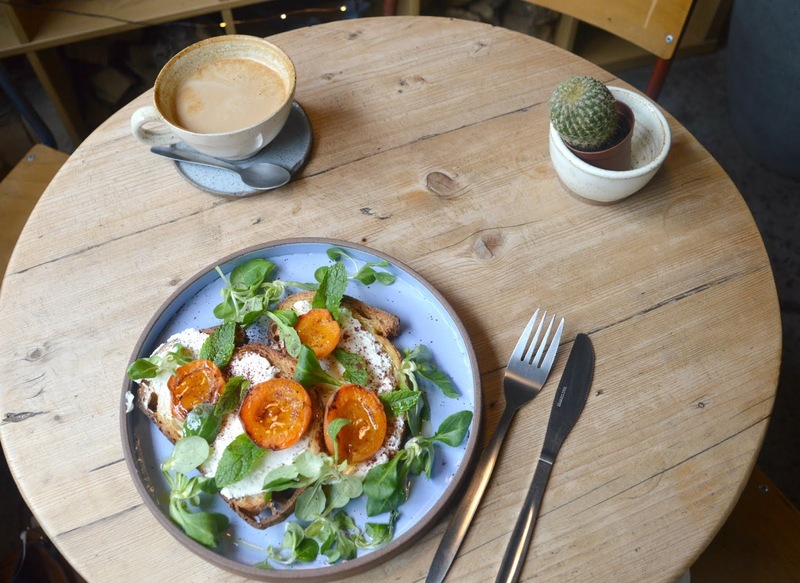 It was so lovely to have something a little different for breakfast and I don't think anywhere else in Newcastle is serving up breakfasts quite like this! As I finished up and made my way towards the exit to pay I found myself gushing at the ladies behind the counter at how amazing the place is and how tasty my breakfast had been. I'm a big believer in letting places know when you've had a fantastic experience and I felt myself wanting to tell everyone I meet about the special breakfasts at Kiln. I'm already making a plan to return, my love for Kiln was well and truly sealed when I spotted the most beautiful looking cakes on their counter as I left (they honestly look incredible!) and I've since discovered that they stay open until late and serve cocktails - yes please! I'll see you all there? I can't believe I've still never been to Kiln. It looks so lovely and that pottery is to die for, I might have to pop down this weekend and try it for myself. 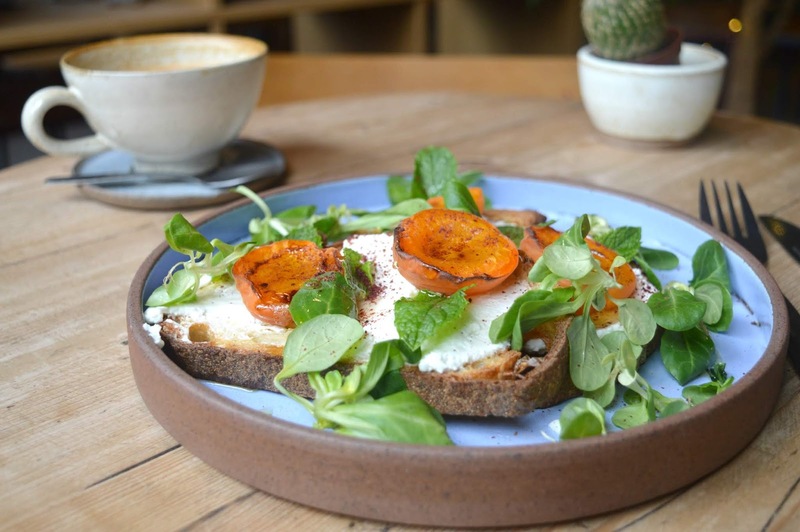 That apricot & goat cheese toast sounds divine! It's one of those places that you just keep saying "we'll go soon" to - it's also a little out of sight out of mind. I'm so glad I've finally been and definitely want to make effort to go more! It is definitely up Steve's street - it has such a nice vibe to it and I think it'd be a great little place to go in the evening too! It's so colourful isn't it? All their dishes look beautiful!